Chad Soriano PhotoBlog: It's a Girl ! Lurking behind the shadowy depths of that contrasty and grainy thermal print, emerges an eight ounce and nineteen week old bundle of joy waiting for the iPhone 5 and iPad with a Facetime camera. 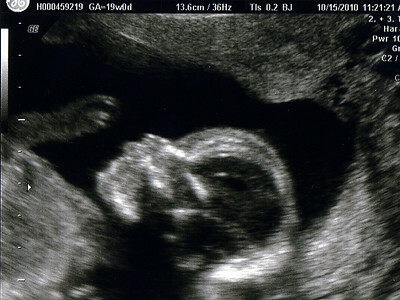 The Soriano family welcomes their newest "soon to be" blessing preferably dressed in all pink according to my daughter. My wife's effervescent glow will turn into labor pains of love a couple of months from now. I will be ready with my HD DSLR to capture that 1080p "crowning" moment. Already my new daughter desires Nintendo Wii and assumes the Wii Remote controller hand position for long Wii Party competitions. My son and daughter are a little dismayed because we cannot add a fifth Wii Remote controller to only a four person console. We will just have to get two Wii consoles in the future. Problem solved ! 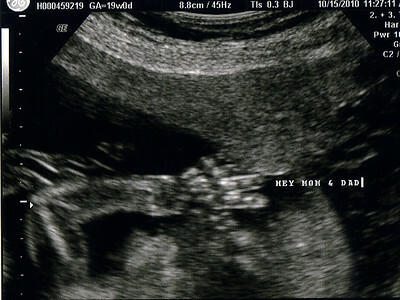 There will be a Sonogram video soon to arrive in my ChadSorianoPhotoBlog. Stay updated by joining my Facebook Fanpage and following me on Twitter. I assure you will not miss any moment. The World Welcomes Newborn Cousin Keelan !